If you need a quick DIY decorating idea for an Academy Awards party, you might like Ty's film-wrapped candles. This project uses old negatives wrapped around flameless LED candles. (Get them 3 for $1 at Dollar Tree.) Me, I'd be tempted to wrap film around the outside of glass candle holders and use real tea lights inside. I know you oughtn't, since film is flammable (as folks aggressively pointed out in the comments on Ty's project) but I like to live dangerously. I've got a million tea lights and zero LED candles. 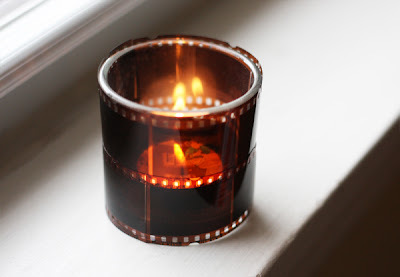 Update: I wrapped some photo negatives around a glass votive holder and put a real candle inside to test it (see image). Burned it for over two hours. The glass got lukewarm to the touch, but nowhere near hot enough to melt anything. The glass was pretty thick, so that helps. I'm not telling you to do this. Don't sue me if you start your house on fire. I'm just reporting my experience; do with it what you will! And never leave a burning candle unattended. This is such a neat idea! I miss real film! Thanks for sharing. This is amazing idea! And I will surely incorporate it in my next Friday Movie Night... or Oscar watching night. Hmmm... maybe they might melt onto the glass if they got warm enough? That could be fun to get off. Such a lovely idea!! I need to give this a go, who cares if its flammable lol living dangerously!! I am sure if you use glass holders it won't be as bad. I want to be your symbolic aggressive one. Hey it's flammable and we all gonna burn ourselves just because of you! I've got to pitch this idea to my boss! I work at a tiny independent movie theater and we do a big oscar party with LED tealights in the theater, and we have PLENTY of old film. It would be perfect! It's 5:38 pm and I just lit up a real tea light in a glass holder wrapped with film. I'll keep you posted. If you don't hear from me within a few hours, it means I burned up. Methinks your neighbors won't be too happy if you do... and I don't mean they'll just be sad with your passing. I guess it would be inconsiderate if I burned down the whole building. However, I'm not worried. I am. That's my duty, right? Being a grownup means lighting real candles with real flame! Just exactly how many hours do you consider "a few"? I need to know when to start worrying. I'm okay, I'm okay!!! :) I just blew the candle out. The glass got lukewarm on the outside, but nowhere near melting the film or catching anything on fire. I'd totally use real grownup fire at my own party. Wow, that would be quite the party conversation piece! Cool. Oh, I love this idea! Time to go digging for old negatives. Love the lights and all of the disclaimers. Just wanted to let you know that I created a link on my blog to this post as part of my weekly web finds and ideas.